Counting down the final few weeks! The 2017 OCDX contest runs from 08:00z on October 7th to 08:00z on the 8th on phone, and on CW at the same times the next weekend (October 14th and 15th). Please read the 2017 rules. We have just a few short weeks left before the contest to build, erect and check out our DX antennas, sort out computer logging and station ergonomics, and become familiar with HF propagation. In addition to regular DXing, other contests (such as the CW leg of the Scandinavian Activity Contest on 16-17th September) are a great way to test our stations and practice contesting before OCDX itself, working friends on the far side and fine-tuning our skills. They may say ‘points make prizes’ but multipliers are the key to winning radio contests. In OCDX contest, Oceania prefixes count as multipliers the first time you work them on each band, where ‘prefix’ includes the number e.g. ZL1, ZM1, ZL2 and ZM2 are four multipliers. Try not to miss the rarer Oceania stations spotted on DXcluster, provided there is propagation to your part of the world at the time. Don’t forget to tune around searching for multipliers, especially in the phone section where DXcluster is less helpful. Knowing whether to change bands or check the long path in the hope of catching valuable multipliers is part of the skill. There’s more to contesting than just CQing, running and clicking spots! Talking of rare multipliers, listen out for Tony VK3TZ and Lee VK3GK on Christmas Island for OCDX Phone as VK9XI and the following weekend on Cocos Keeling Island for OCDX CW as VK9CI. If you intend to enter OCDX contest, please let us know about any special plans, especially if you will be activating rarer entities or entering as a club. 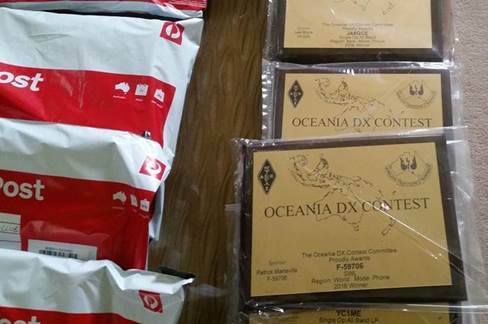 Thanks to our generous sponsors, numerous trophies and plaques are up for grabs again this year, including the new Ken Jewell VK3AKK Memorial Plaque for the leading CW single-operator 15m entrant from Oceania. In addition, category winners in each continent and country earn winners’ certificates. We are offering participation certificates to encourage everyone to make at least a few QSOs: to qualify, simply enter with as little as one valid contest QSO! For clues about what to expect during the contest and who your rivals might be, catch up with results, soapbox comments and records from previous OCDX events on the website. Most importantly, take a moment this month to study the OCDX rules. Have you decided which section to enter yet? Any questions? Send an email to info@oceaniadxcontest.com .